We’d love your help. 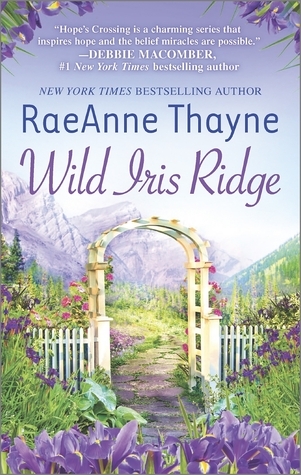 Let us know what’s wrong with this preview of Wild Iris Ridge by RaeAnne Thayne. And it's likely to tear them apart. Because it was Brendan's late wife, Jessie—and Lucy's best friend—who'd brought them together in the first place. And since Jessie's passing, Brendan's been distracted by his two little ones…and the memory of an explosive kiss with Lucy years before his marriage. Still, he'll steer clear of her. She's always been trouble with a capital T.
To ask other readers questions about Wild Iris Ridge, please sign up. I was lucky enough to receive and advance copy of Wild Iris Ridge to review. I discovered RaeAnne Thayne about a year ago, and have since devoured pretty much everything thing I can find written by her. She has a great way of writing characters who feel real, and who have depth. The towns about which she writes become almost characters of their own, and Hope's Crossing is no exception to this rule. The families and characters that make up the town of Hope's Crossing remind be a bit of my own gro I was lucky enough to receive and advance copy of Wild Iris Ridge to review. I discovered RaeAnne Thayne about a year ago, and have since devoured pretty much everything thing I can find written by her. She has a great way of writing characters who feel real, and who have depth. The towns about which she writes become almost characters of their own, and Hope's Crossing is no exception to this rule. The families and characters that make up the town of Hope's Crossing remind be a bit of my own growing up in a small town. While a small town can be an ideal place to be, it does not exempt you from problem and trials, and adding to it, everyone knows about everything that goes on in town. Brendan and Lucy's story is an interesting one of misunderstanding and hurt. They have a muddied past, but are brought together by two sweet children (with the help of a couple puppy dogs and an entire town rooting for them). Both characters fight against their growing attraction to each other, and do everything they can to avoid each other, but seem to be thrown together at every turn (and when that happens, sparks fly..romantically and often tempters too). RaeAnne Thayne takes us back to Hope's Crossing for a sweet romance that deals with two people who get a chance to explore what might have been. Lucy Drakes came to Iris House during her teen years to live wit her Aunt Annabelle. The adjustment was a difficult one considering that her mother had just overdosed and had a father who didn't want to deal with a teenager who was close in age to his new wife. What Lucy found was security and love. Her cousin, Jessie was also living there and they soon RaeAnne Thayne takes us back to Hope's Crossing for a sweet romance that deals with two people who get a chance to explore what might have been. Lucy Drakes came to Iris House during her teen years to live wit her Aunt Annabelle. The adjustment was a difficult one considering that her mother had just overdosed and had a father who didn't want to deal with a teenager who was close in age to his new wife. What Lucy found was security and love. Her cousin, Jessie was also living there and they soon became the best of friends. During school she focused on her grades and becoming a success. Leaving for college was the next step, but she knew Iris House would always be home. I liked Lucy, but always felt so much empathy for her. I can't imagine the hurt she endured at the hands of those who were suppose to love her unconditionally. She has been living in Seattle and successful in marketing with a company since college, but is suddenly fired and her life is turned upside down. Lucy decides to return to Hope's Crossing and settle everything with Iris House while regrouping and deciding what to do with her career. What she hadn't planned on was the fire of running into Brendon Caine! The fire was easily contained, but her animosity towards Brendan was a completely different matter entirely. Brendan Caine has lived in Hope's Crossing his entire life except for the time at college and a brief 2 year stint with the NFL before his injury. Since returning he has worked at the fire department, married and the father of 2 young children. 2 years ago his life was forever changed when his young, pregnant wife died suddenly. Loosing Jessie and their unborn child was a heartbreak he was still dealing with. I can't imagine how hard it was for him to get up in the morning and take care of his family. Lucy and Brendan had met briefly years ago, but Brendan didn't persue a relationship and that literally broke Lucy's heart. To make things worse he started dating Jessie and proceeded to marry her. Lucy never warmed up to Brendan, but maintained a close relationship with Jessie and eventually her children. Even after Jessie's death Lucy kept in contact with the children. Lucy decides for the children's sake to try to put her feelings for Brendan aside and hopefully to at least become friends. Suddenly Brendan is seeing Lucy differently and he's not certain he likes it. When I read that this will be the last of the Hope Crossing books (with a caveat of maybe), I was disappointed, especially after reading Wild Iris Ridge. Brendan and Lucy have a history that they must work through When I read that this will be the last of the Hope Crossing books (with a caveat of maybe), I was disappointed, especially after reading Wild Iris Ridge. Brendan and Lucy have a history that they must work through in order to move on. Their struggles and everyday life were so very heartfelt and real to me. I didn’t feel any personal angst reading this wonderful novel – as in “somebody tell me why the heck I wanted to read this story?” – however I DID feel all the hero’s and heroine’s struggles. Ms. Thayne does such a wonderful job creating this world we call a story. Brendan and Lucy are so good for one another and their personal struggles are real and such great reading. I have to say that my personal favorite supporting characters are Faith and Carter. What adorable munchkins! I truly believe their dad did a wonderful job raising them after their mom passed away. A. Dor. Able. I highly recommend everyone buy and read this book. I received a copy in exchange for an honest review however it was on my “to buy” list, as are all of this author’s books. I truly enjoyed Wild Iris Ridge and managed to lose myself in the world of Hope Crossing one more time. We return to Hope’s Crossing with Lucy Drake. She has come back to take care of her the home left to her by her aunt. While excited to be back she is not excited to see Brendan Caine. Brenden was married to Lucy’s best friend, Jessie, who recently passed away. They had a little thing before Brendan even met Jessie. They both remember that steamy hot kiss and while Lucy has been an “aunt” to his kids, they only had to endure each other’s presence on rare occasions. Now she is back in Hope’s Cross We return to Hope’s Crossing with Lucy Drake. She has come back to take care of her the home left to her by her aunt. While excited to be back she is not excited to see Brendan Caine. Brenden was married to Lucy’s best friend, Jessie, who recently passed away. They had a little thing before Brendan even met Jessie. They both remember that steamy hot kiss and while Lucy has been an “aunt” to his kids, they only had to endure each other’s presence on rare occasions. Now she is back in Hope’s Crossing and that means trouble with a capital T for both of them. All of my visits to Hope's Crossing have been wonderful and I hope I get to visit again very soon as I catch up on the ones I missed. You can read them order but they do read well as stand alone too. I am really sorry to see this series end but it goes out on a great high note. I have been a reader of RaeAnne Thayne books for years, throught the Hope's Crossing series. I am happy to say her new book, Wild Iris Ridge, did not disappoint. I enjoyed the friendship Branden and Lucy grew to have. It was fresh (although they had some history) and tender. Neither Brandon or Lucy felt their friendship could develop into a relationship because of Jessie. Jessie was Lucy's cousin and Branden's dead wife. This made their deepening friendship uncomfortable. Branden, speaking with friends, even called Lucy, "prickly " and a "little idiot." Jessie had always felt that Lucy was a 'fly in the ointment' of their marriage. The town, Wild Irish Ridge, was a very pleasant, caring, comfortable place. The neighbours and townsfolk all knew one another and saw the relationship budding between the two main characters. I believe the addition of the abandoned puppies brought all of our characters to life. It certainly changed the lives of the three children involved. Wild Iris Ridge is an inviting place and an enchanting story with truly believable characters. I loved that the story is not all rainbows and roses. Everyone had their own trials and issues. I sure wish, however, that towns like this actually existed. I will be awaiting RaeAnne's next release later this year. I just finished my preview copy of Wild Iris Ridge. I'm enchanted with RaeAnne's books and have read all the Hope's Crossing books. As usual the characters have a slightly troubled past but through the book, this is worked out and a happy ending results. I love RaeAnne's structure of the book and her writing style. I felt like I was in Hope's Crossing and could feel what the characters were feeling thoughout the book, that doesn't always happen when I read a book. The main characters, Lucy and Brend I just finished my preview copy of Wild Iris Ridge. The main characters, Lucy and Brendan had a past (one night) and she moves back into town to a house her aunt had owned. They fight their attraction thru the book, but resolve it at the end. I'm very sad this is the end of this series as I've enjoyed it thoroughly. If you haven't read the entire series, you need to put them on your read list for sure! My favorite part of the town is the day the whole town comes together and fixes up the town and area that need improvement, then have a Gala at night to fund raise for scholarships named after a character that was killed due to a car accident in the first book in the series, Blackberry Summer. Coming home left much to be desired for Lucy Drake. However, circumstances beyond her control drew her back into the heart of community, Hope's Crossing. Will she find the comfort she desires? Will her life path become clearer so she could move on? Or will she become enmeshed in the hope that some things just meant to be? Will she be able to overcome the bigger obstacle named Brendan Caine? To see if Lucy finds her heart's desires, take a trip with her up to Wild Iris Ridge to feel the hope and feeling of community, family and love. We return to Hope Springs for a last time with Brendan and Lucy. They had one date before Brendan fell in love with Lucy's cousin and best friend. Lucy returns to Hope Springs after a personal upheaval and reconnects with Brendan and his family two years after his wife's death. Lucy fits well with Brendan's family, but Brendan doesn't want to admit it. I loved reconnecting with Gen (who knew we would like her so much!) and Dylan. This was a good farewell to Hope Springs! Intriguing and beautifully written with so many emotions from start to finish. I love ReaAnne's style of writing, and how the characters come alive as I am reading, making me feel a part of the story. So much warmth and love as Lucy and Brendan overcome past struggles and find the hope and future in each other. Once I started, I could not put it down. The story will draw you in and leave you wishing you were a part of Hope's Crossing! The book was a little slow to start but once into it, it is a typical Raeanne book with lively and interesting characters, although I felt there could have been more depth as to why the main characters didn't get together 10 years earlier. It was nice to see Dermot getting his lady. I loved the way Hopes Crossing and its people have grown and evolved through the series. Brendan has 2 small children with Jessie. Jessie died of an undiagnosed heart condition when she was pregnant with their 3rd child, a son. Lucy was Jessie's cousin and best friend. She moved back to Iris House, where she lived with her great-aunt, Annabelle, after she is fired from her job. Brendan and Lucy met before she went to an internship, and kissed, she gave Brendan her name and number but Brendan didn't call, he met Jessie, and started dating her, and one year later he proposed. Lucy has Brendan has 2 small children with Jessie. Jessie died of an undiagnosed heart condition when she was pregnant with their 3rd child, a son. Lucy was Jessie's cousin and best friend. She moved back to Iris House, where she lived with her great-aunt, Annabelle, after she is fired from her job. Brendan and Lucy met before she went to an internship, and kissed, she gave Brendan her name and number but Brendan didn't call, he met Jessie, and started dating her, and one year later he proposed. Lucy has never forgotten that kiss, and tried to undermine their relationship to Jessie, but after they become engaged, she stopped. Lucy watches the kids when Brendan has to work, he is the fire chief of Hope's Crossing. Lucy wants to turn Iris house into a B&B, which was what Lucy and Annabelle wanted, and talked about doing before they passed away. Lucy's half sister Crystal is brought to stay with her by their mutual father after Crystal is expelled due to drugs. While going to the grocery store they meet Brendan and the kids, and Faith and Crystal hear a noise and discover 2 puppies in the dumpster! They get them out and take them to the vet and Faith takes the girl dog, Daisy, and Crystal takes the boy dog, Max. Brendan is not sure he wants to have a dog, but after seeing what the dog does for the kids, by teaching them responsibility, and bringing Faith out of her shell, he tells Lucy he can't take the dog away. We are also invited to Carter's 6th birthday party! He invites Lucy and Crystal and they both promise to attend. Lucy and Brendan kiss, again, and Lucy says they have to stop because anyone could walk in and see them, and they are both not ready to deal with that. Brendan and Lucy are tasked with cleaning the Wild Iris Ridge Trail, they kiss, and then fight when Brendan asks Lucy to wait for him to come to terms with Jessie's death, and wants to start a relationship with her. Lucy looses her sunglasses and goes back to find them but Max slides down the hill and Lucy goes to get him but she falls and breaks her ankle. Brendan finds out she is missing when Crystal calls 911 and reports it, Brendan goes to the ridge and finds her and tells her he loves her, he was so scared he was going to loose her. He stays with her until help arrives, and stays with her at the hospital also. The end of the book is weddings! Brendan's sister Charlotte marries Spencer Gregory and his brother Dylan marries Genevieve Beaumont (who both have books in the series). I enjoy Hope's Crossing series. The secondary characters are old friends that we can catch up on their lives. The main characters are likeable. Lucy has come to Hope's Crossing at a time in her life is in a crisis. She has been left a big house and she is thinking of turning it into a bed and breakfast. Lucy years ago had shared one kiss with Brendan. Then Brendan started dating her best friend. Since then she has tried to stay away from him. But she loves his children. So she is not happy to run into him with just being in town for a short time. Brendan Caine is the fire chief. He has been a widower for two years. He has two cute children. His late wife was Lucy's cousin and best friend. He is not ready to start dating. He can not stop thinking about Lucy though he keeps trying to stay away from her. Carter Caine is a cute five year old. Who is active. Faith Caine is a nine year old. She loves to read. It even has cute animals that are loveable and make you want to take them home with you. The setting is beautiful sounding and makes me want to go for a walk in the mountains. Hope Crossing is in Colorado right close to the mountains. I liked the drama it was not drastic but easy to read and care about the characters. I really like how the town has a day of service and every year more people get involved to help each other and the town. This is the second book of RaeAnne’s that I have read and the second book that I have read in this series. I thought that RaeAnne did a great job of giving enough detail about the characters that allowed you to feel like you really knew who they were. In addition, I think she did a great job of making this story able to stand on its own as if it wasn’t part of the series. The only reason that I knew that it was part of a series is 1) I read the previous book before this one and 2) it said it was This is the second book of RaeAnne’s that I have read and the second book that I have read in this series. I thought that RaeAnne did a great job of giving enough detail about the characters that allowed you to feel like you really knew who they were. In addition, I think she did a great job of making this story able to stand on its own as if it wasn’t part of the series. The only reason that I knew that it was part of a series is 1) I read the previous book before this one and 2) it said it was number 7 in the Hope Crossing Series. In addition, what I really liked about this book is that it was realistic. She had the characters laugh, cry, be mad at each other and make up. I really felt like these were two people that could be real people that I would know. What also was nice about the story was how she incorporated family into the story. She made you really feel like you were a part of the Caine family. RaeAnne Thayne hits it out of the park with her current book Wild Iris Ridge. Lucy came to Hope's Crossing as a troubled teen and quickly left town and succeeded in marketing. Product launch failure finds her out of a job so Lucy heads back to Hope's Crossing to open a bed and breakfast in the old house left to her by her great aunt. On her first night back Lucy starts a fire in the chimney and who arrives but the Fire Chief Brendan Caine. He was a long ago interest and her departed cousin's wid RaeAnne Thayne hits it out of the park with her current book Wild Iris Ridge. Lucy came to Hope's Crossing as a troubled teen and quickly left town and succeeded in marketing. Product launch failure finds her out of a job so Lucy heads back to Hope's Crossing to open a bed and breakfast in the old house left to her by her great aunt. On her first night back Lucy starts a fire in the chimney and who arrives but the Fire Chief Brendan Caine. He was a long ago interest and her departed cousin's widower. Brendan is still reeling with the loss of his wife and child and struggling to raise 2 children. If Lucy didn't have enough problems trying to rebuild her life, her father drops off her teenage out-of-control half sister Crystal who had that just got kicked out of school. I could NOT put RaeAnne Thayne's Wild Iris Ridge down! If I could give this book 6 stars I would. I love ALL of RaeAnne's Hope's Crossing books, but she definitely saved the best for the last. I felt everything in this book. I laughed, I cried, I got excited, I swooned, I felt loss, I felt hope, I even squealed out loud. I was even a little jealous because I want Brendan all to myself. ;) Wild Iris Ridge is such a heartfelt story. I was very sad to see this book end, and I was even sadder knowin I could NOT put RaeAnne Thayne's Wild Iris Ridge down! If I could give this book 6 stars I would. I love ALL of RaeAnne's Hope's Crossing books, but she definitely saved the best for the last. I felt everything in this book. I laughed, I cried, I got excited, I swooned, I felt loss, I felt hope, I even squealed out loud. I was even a little jealous because I want Brendan all to myself. ;) Wild Iris Ridge is such a heartfelt story. I was very sad to see this book end, and I was even sadder knowing this was the last book in the Hope's Crossing series. I seriously want to pack my bags and go live in Colorado. I was lucky and received an advanced reader copy of Wild Iris Ridge. This was my first Hope's Crossing experience and I thoroughly enjoyed it. Hope's Crossing is a small town where community and family matter. This is Brendan and Lucy's story. Brendan is the local fire chief, a widower with two young children. Lucy is his children's godmother. She left town after high school to make her way in the big city, only visiting occasionally, until she lost her job and decided to return to the only place I was lucky and received an advanced reader copy of Wild Iris Ridge. This was my first Hope's Crossing experience and I thoroughly enjoyed it. Hope's Crossing is a small town where community and family matter. This is Brendan and Lucy's story. Brendan is the local fire chief, a widower with two young children. Lucy is his children's godmother. She left town after high school to make her way in the big city, only visiting occasionally, until she lost her job and decided to return to the only place that ever really felt like home. Sparks fly right off the bat! Brendan and Lucy share more than just a love for Brendan's children. Throw in Lucy's half-sister and a couple of cute puppies, and this story is filled with the fun of small town life. I have fell in love with this series from book one...hated to see it end but what an ending to an awesome series.cannot wait for more from Raeanne. Lucy was best friends with Brendans wife Jessie, but Lucy always had feelings for Brendan and loved there kids. When her Aunt dies and leaves her the Queen Anne house she goes back to her hometown to fix up the place and get ready to sell it. But things do not turn out as you want them to. She runs into Brendan and tells her of the plans, she starts to I have fell in love with this series from book one...hated to see it end but what an ending to an awesome series.cannot wait for more from Raeanne. Brendan and Jessie shared one kiss in the past and then he married her best friend, Lucy. Brendan and Lucy share a life and two children. When Lucy dies Brendan is devastated and tries to get on with his life. Lucy couldn’t wait to leave Hope’s Crossing but she is back to take care of her Queen Anne home left to her by her aunt. Brendan and Lucy get reacquainted and learn things about each other realizing that they thought they knew each other but really didn’t. They begin to build a friendship t Brendan and Jessie shared one kiss in the past and then he married her best friend, Lucy. Brendan and Lucy share a life and two children. When Lucy dies Brendan is devastated and tries to get on with his life. Lucy couldn’t wait to leave Hope’s Crossing but she is back to take care of her Queen Anne home left to her by her aunt. Brendan and Lucy get reacquainted and learn things about each other realizing that they thought they knew each other but really didn’t. They begin to build a friendship that turns into more. Another great story by RaeAnne Thayne. I really hated to leave Hope’s Crossing as all of the books in this series have been wonderful stories of hope and love. Check out Wild Iris Ridge as well as the others in this series. You won’t be sorry. Another great story written beautifully by RaeAnne Thayne. A wonderful romance story. Bringing the feelings back after a love marries your best friend. Lucy's friend Jessie marries Brandon. Jessie dies and leaves Brandon with two little ones to raise. Lucy has left town but she is back to care for the Queen Anne home her aunt left her when she passed away. This shouldn't be a problem at all till she sees Brandon again. Or will it be? I love the way the characters are bought back together to learn about each other. I love stories of second chances don't you? I feel in love with little Carter and Faith. Melted my heart the relationship growing between them and Lucy. Wonderful story. What a wonderful ending to the Hope's Crossing series! This is a book that you read and you cannot stop reading it! Lucy Drake returns to town after losing her job and deciding she wants to open a B&B in her aunt's old house. Brendan Caine, is the one who got away. The one who she dated and left to go to college and whom fell in love and married her cousin. He is now a widow with two kids who is trying to deal with Lucy returning to town. The relationship that develops and gradually grows fr What a wonderful ending to the Hope's Crossing series! This is a book that you read and you cannot stop reading it! Lucy Drake returns to town after losing her job and deciding she wants to open a B&B in her aunt's old house. Brendan Caine, is the one who got away. The one who she dated and left to go to college and whom fell in love and married her cousin. He is now a widow with two kids who is trying to deal with Lucy returning to town. RaeAnne ThayneI received the book before release as a member of the review crew. I have enjoyed all of RaeAnne Thayne's books set in Hope's Crossing. This one was the best. I am disappointed that this is the last story in the series. There are still stories to be told. How can you not love a story that includes little children, puppies, a big sister looking out for her younger sister and the growing love between two people who thought they couldn't be in the same room? This is the last of the Hope's Crossing books. I really hated to see the end. Once again RaeAnne Thayne has written a book with much heart and warmth. The characters have a past and a tragedy to overcome. Those are overcome with realistic struggles, humor and heartache. The path may be torturous and twisted, but it leads to the happiness and love we all desire for ourselves. I just finished reading my preview copy of Wild Iris Ridge. I love this series, Hopes Crossing, this one didn't disappoint at all. Love the story of Brendan and Lucy. RaeAnne writes so well that the characters come alive. This is one of my favorite series to read. I was cheering for Brendan and Lucy from the very beginning! I think this is my favorite book in this series! I truly love this whole town and all the folks in it!! !